Players and goalies tend to love this game. 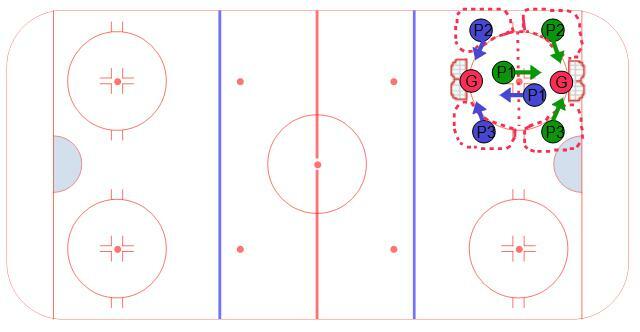 It is a 3 on 3 game played in a very small area and therefore players create lots of scoring chances and goalies are very active. The game is played using two nets, one on each end of the face off circle. One player from each team is allowed inside the circle and is only allowed on the defensive half. The other two players are on the offensive side of the circle but cannot go inside the circle. Allow players to play for 45 seconds and then either switch out players or offer a rest to keep the pace of play high.